The WEMPE Chronometre is a timekeeper in a class of its own and presents itself in an elegant mahogany casing. 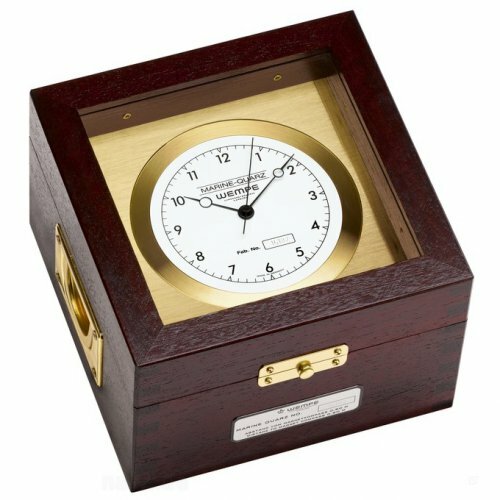 It functions with a battery-operated quartz movement and is equipped with a white dial on a polished brass plate. The white dial measures 95 mm in diametre. The 3.5 kg WEMPE Chronometre fulfills the inspection requirements of the former German Hydrographic Institute (now: BSH) and is convincing as an electronically precise timekeeper, which continues working without interrupting its motion when the battery is changed. The WEMPE Chronometre is equally appropriate for a professional use as well as an exceptional present for fans and adepts of the maritime.